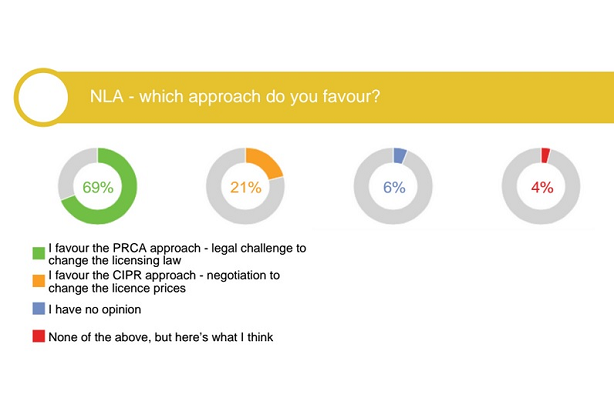 Two-thirds of the nearly 500 respondents to a PRCA-commissioned survey say they prefer the trade association's approach to NLA licensing to the stance adopted by the CIPR. On 17 November, the Newspaper Licensing Agency announced a new licensing structure for PR agencies wanting to share news clippings with clients. The CIPR welcomed the "simplified structure" of the new regime, but the PRCA continued its previous opposition to the NLA, saying the new structure was "smoke and mirrors" and vowing to challenge it. A heated exchange took place on Twitter that evening in the weekly #PRtalk discussion, with PRCA director general Francis Ingham saying it was "tragic" that the CIPR had been "used" by the NLA, and accusing the CIPR of engaging in "secret talks" with the NLA. CIPR PR and policy manager Andrew Ross rejected Ingham's suggestions that the CIPR was in league with the NLA, saying: "We were approached upon consultation which isn't uncommon; saying otherwise is misleading." Both bodies said they were open to further debate on the industry's relationship with the NLA. A spokesman for the CIPR said engagement with the NLA was "both a common sense position and a sound public relations approach". He said: "If the CIPR was to shut itself out of any kind of practical influence on this issue, it would not be acting in the best interests of members, particularly small businesses whose growth potential was restricted due to an unnecessarily complex licensing structure. "Across the board, the CIPR wants to see the entire copyright position simplified and we will continue to approach achieving this objective proactively with all stakeholders." Ingham, who writes about the NLA issue in his latest column for PRWeek, said: "I will tomorrow be writing to all of the other bodies representing PR professionals in the UK, inviting them to join a copyright council of war, and to co-ordinate our efforts. I would be utterly delighted if the CIPR were to join us in this effort."